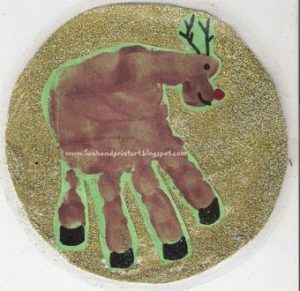 This Handprint Reindeer Door Decoration is such a great keepsake and a unique Christmas decoration. 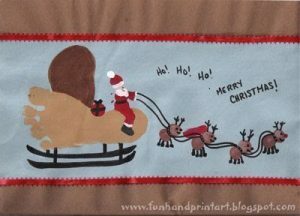 I am very excited to hang this up next Christmas! 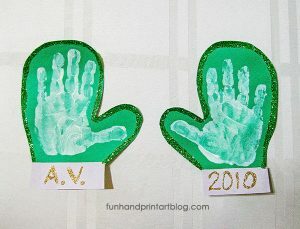 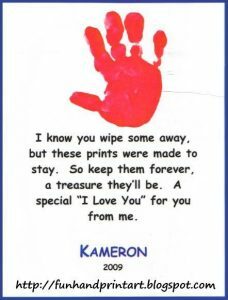 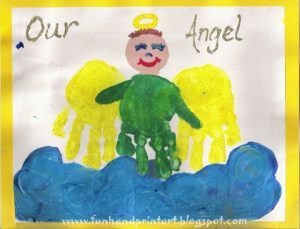 I started by pressing my son’s brown handprint on a piece of green construction paper (the color gives it a nice border). 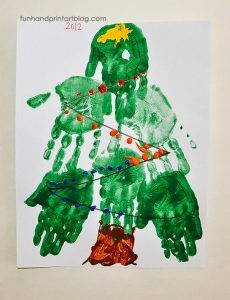 Add a thumbprint under the thumb (see photo). 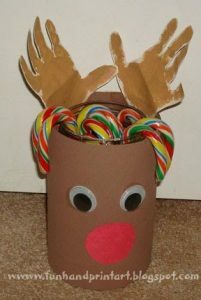 This will make the head. 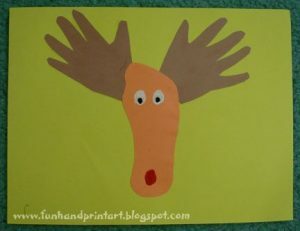 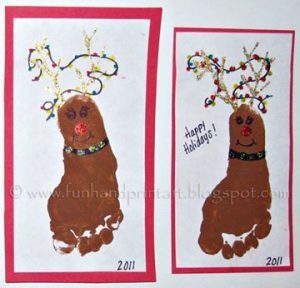 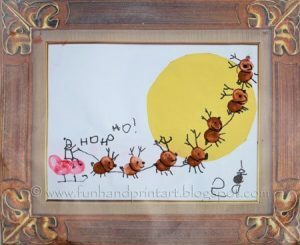 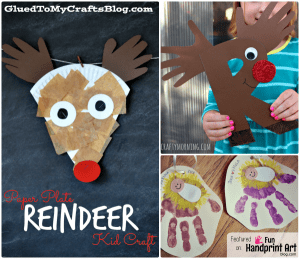 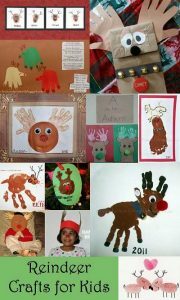 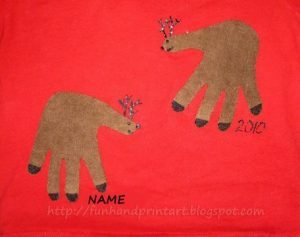 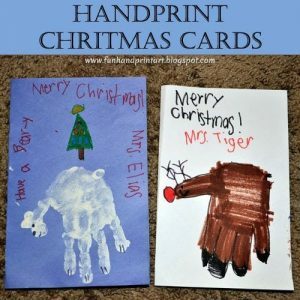 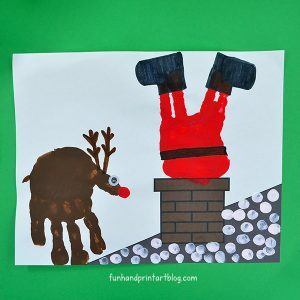 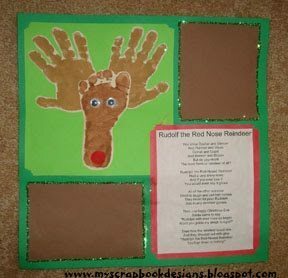 Turn the handprint into a reindeer by adding antlers and hooves. 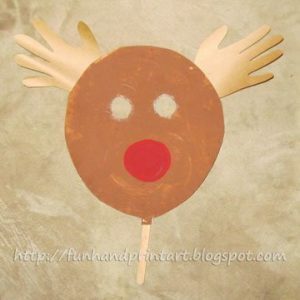 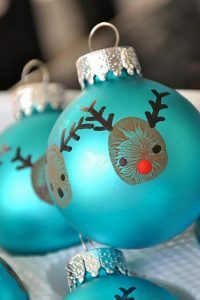 Turn it into Rudolf by adding a red nose! 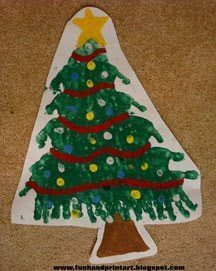 I cut around the outline and then used acid-free glue to adhere it to a stronger paper that I had cut into the shape of a circle. 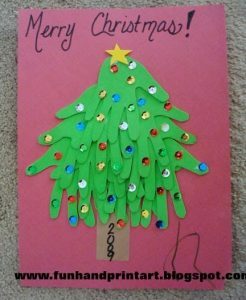 I actually used a paper plate, but something like card stock would also work. 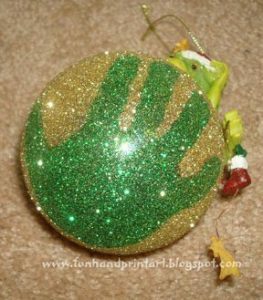 To make it more festive, I spread glue over the the remaining areas (not covered by the handprint) and shook gold glitter over it. 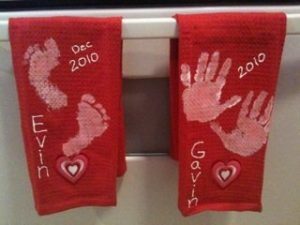 I repeated everything with the other handprint. 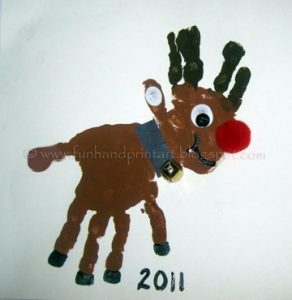 The next step is also optional- I covered both circles with clear contact paper so it wouldn’t get wrecked as easily. 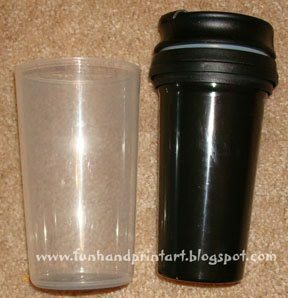 Punch a hole in at the top and the bottom of each circle. 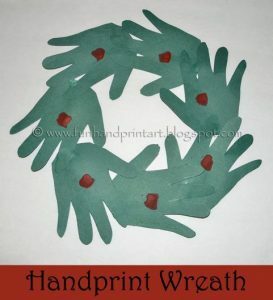 Next, I strung a piece of red ribbon through the top hole of one to create a loop for hanging and also strung ribbon to attach the two circles together. 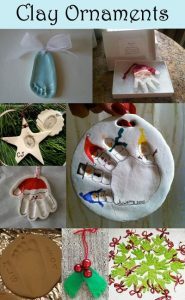 Last, place a bell on a sturdy piece of string. 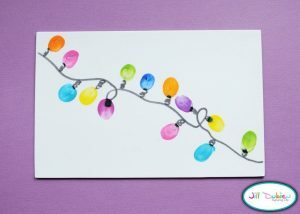 I then took green and yellow beads and put them over BOTH string ends. 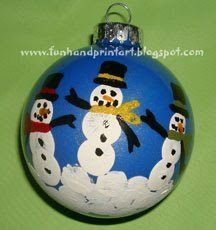 Tie the strings to the circle making sure the knot is in the back. 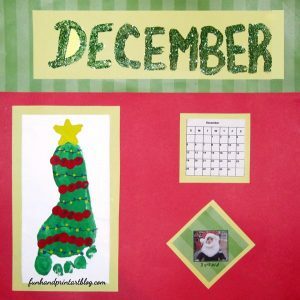 Repeat with another one. 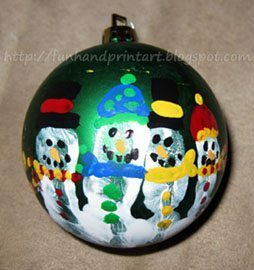 Now you have a BEAUTIFUL decoration that you can cherish for many years. 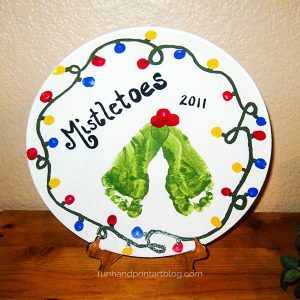 How FUN is it to hear the bells jingling too?! 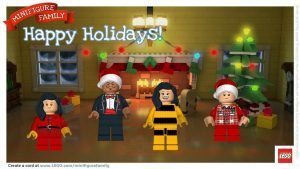 We made a LEGO Minifigure Holiday Card & you can too! 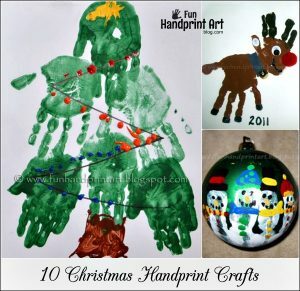 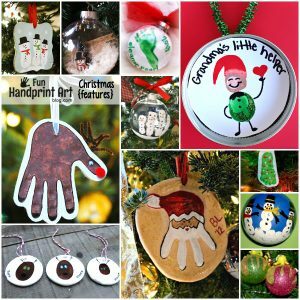 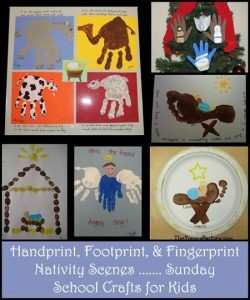 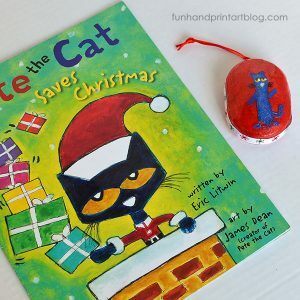 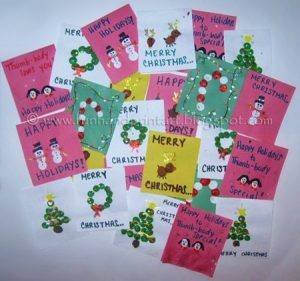 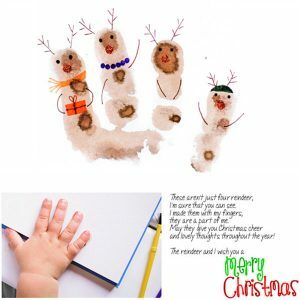 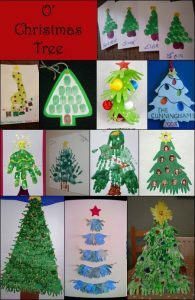 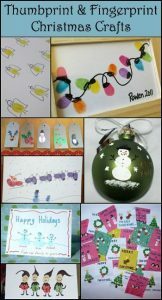 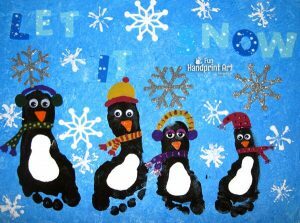 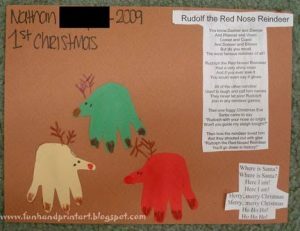 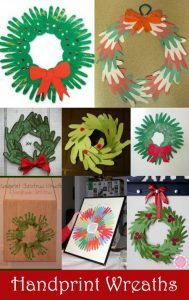 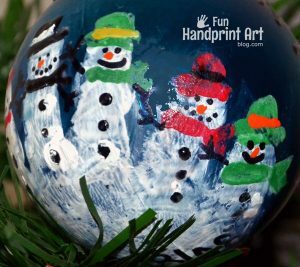 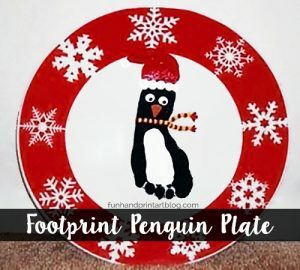 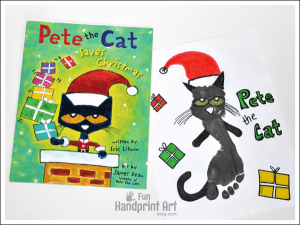 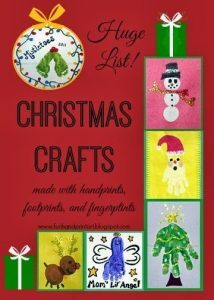 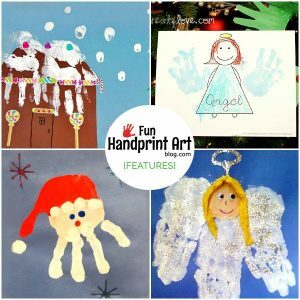 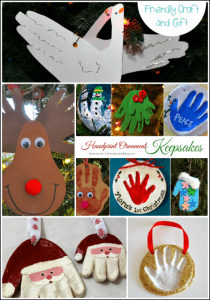 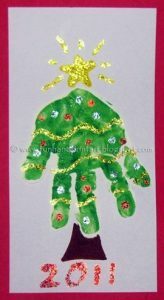 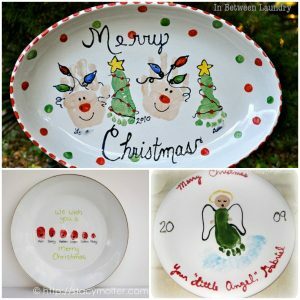 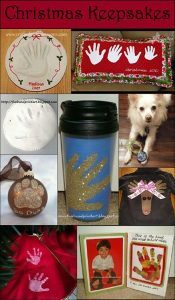 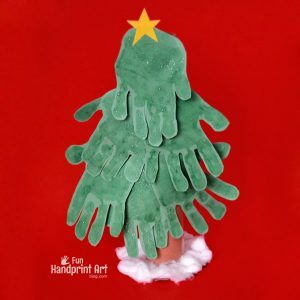 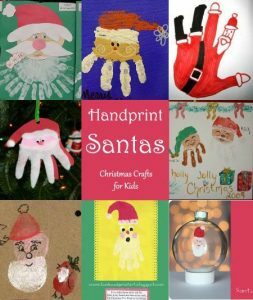 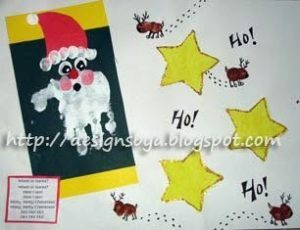 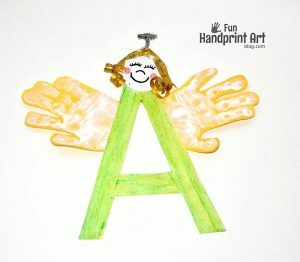 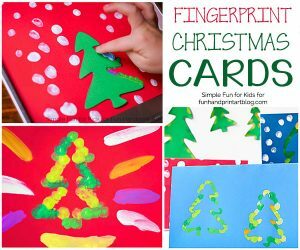 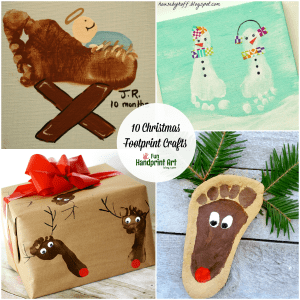 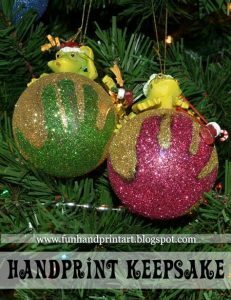 Handprint Santa Craft - My favorite Christmas keepsake with a sweet poem! 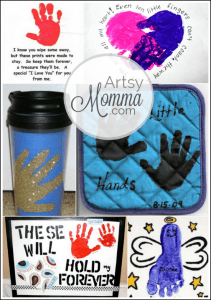 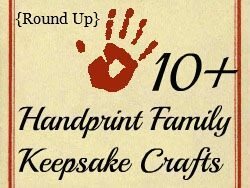 Adorable Etsy Shop + a Handprint Plaque Giveaway! 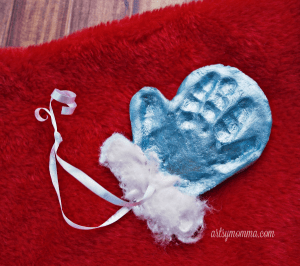 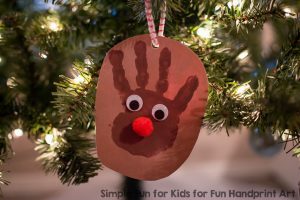 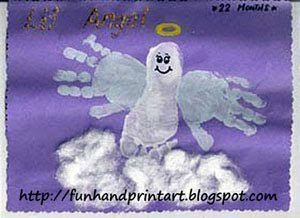 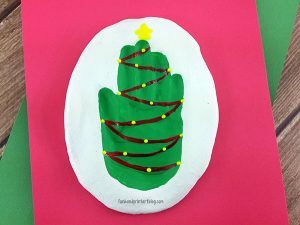 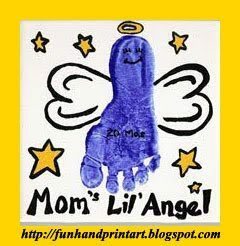 Sparkly Handprint Mittens Craft - Easy Winter Craft For Kids! Decorate the Table with this Handprint Gingerbread House Placemat Craft! 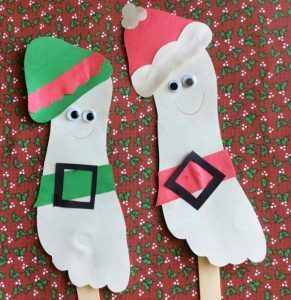 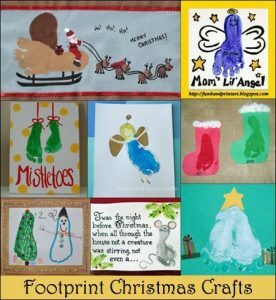 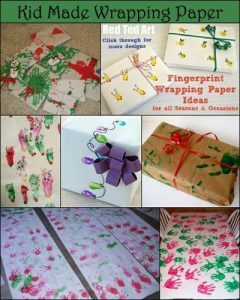 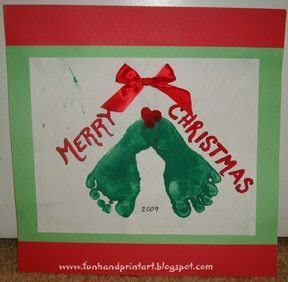 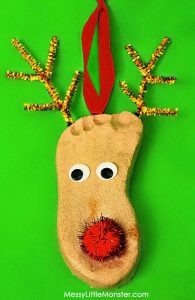 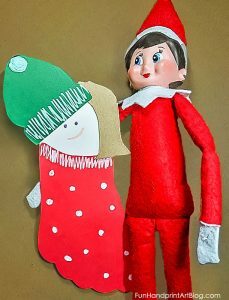 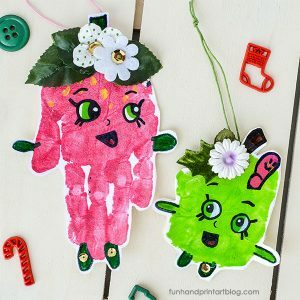 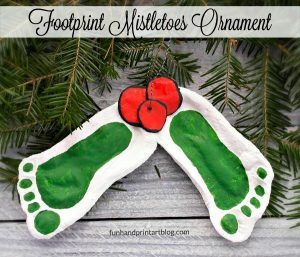 Easy Christmas Craft For Toddlers: Make Footprint Stockings! 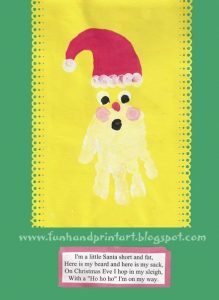 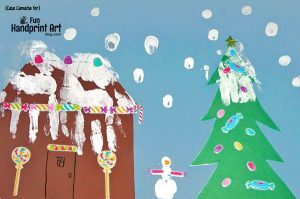 Stuck Santa Hand Painting - includes a background template! 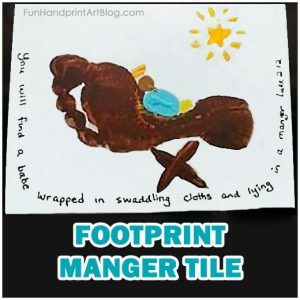 Another wonderful idea. 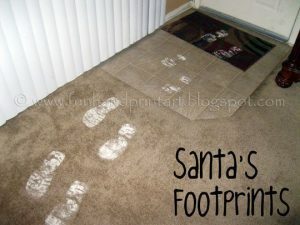 I will have to do this next year.